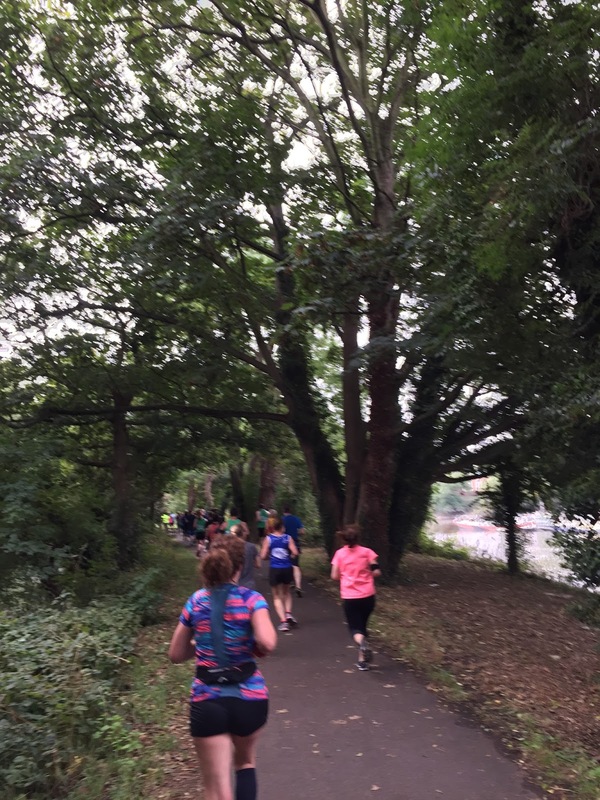 Location: This is the ONLY running race which takes place in Kew Gardens. This automatically makes it freaking great. You go by a giant pagoda, you see amazing greenhouses that you wish you could have (if you even had a garden that would be a great start). Well OK, maybe not a greenhouse of that size, but come on London, a little patch of garden would be wonderful. 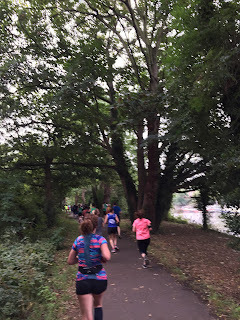 The route is not limited to Kew, it also takes in the Thames path, turning around in a bit of a loopy fashion around Teddington Lock (the 10k turned around at Richmond Lock, and the marathon goes all the way towards Bushy Park before coming back) around Ham House. Stuff to look at is at an all time high. Again, you don't really miss headphones. By the way, headphones are allowed, but like all races, they are strongly discouraged. Bib Pick Up/Bag Drop: I did not have to utilise either of these on this race, as Mr. Moose acted as my bag drop and as I was in the UK they mailed me my race pack. Heartrunnergirl picked up her bib no issues. She also found another Dutch runner simply by looking at her shoes... that's what I call situational awareness! The end of the race is in Old Deer Park, but they bring your bags over so there is no trundling back to the start to get your stuff. I was told though that the loos at the end had crazy long queues. I cannot speak as to the validity of this as I did not utilise them. Atmosphere: More like your typical race vibe. As with any tow path and any given point in London, the constant battle between runner and cyclist was quite high. I just wish people would get along sometimes. I also wish people would not run with headphones during races, because they have no chance of hearing other runners or cyclists using the path. I know I know there is technically no difference between a runner just out for a jog and a runner with a bib on. I feel as though you are representing runners when you put a bib on-- so it behooves all runners to put your best foot (pun intended?) forward. Cyclists should feel the same way... I don't know I feel like I am talking in circles. It's a widely contested debate....and the battle rages on! 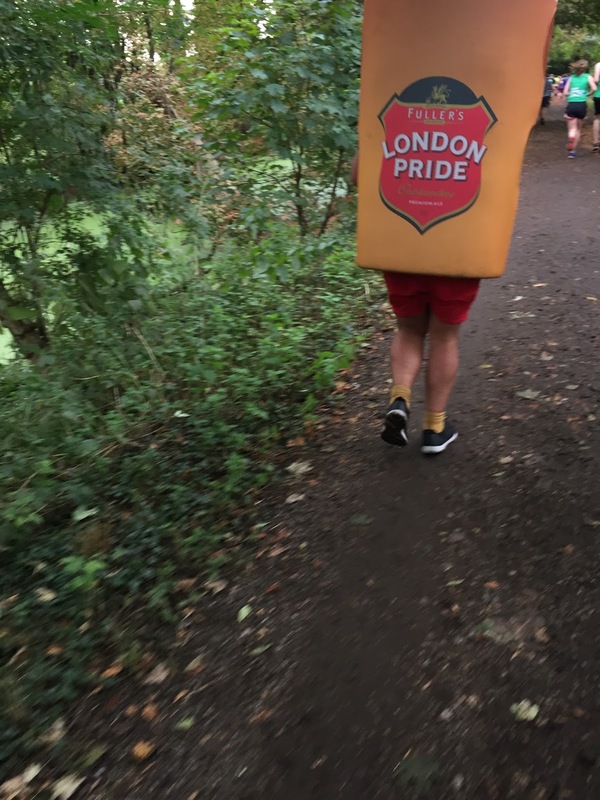 There was a man dressed as a Fuller's Beer-- he won the race in my eyes. Drink Stops/Marshalls: I did grab a water at some point along the way and kept it with me for a few miles just to have a few sips until it was empty. 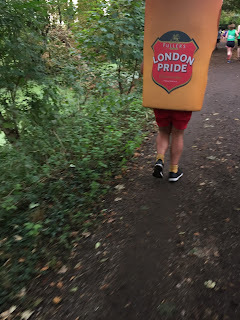 They also had Lucozade, but personally I cannot handle the stuff when running-- too sugary and since I am clumsy I typically spill more on me than I drink, resulting in sticky hands. Lovely volunteers and little kids I said thank you to were picking up discarded bottles along the path. I felt very sorry for the lovely marshall at the very end. She had the tough job of telling the half/full marathon runners to go left (a final, painful loop in a field where you could see/hear the finish) rather than go right (a nice straight sprint to the finish for the 10k). I tried to smile at her as I begrudgingly went left, but it probably looked like a grimace. Post Race: I think I got the last bag from the finishing crew as people after me seemed to just be carrying as much as they could in their arms. I am happy to report they had plenty of fluorescent yellow (I am talking VERY yellow) racing shirts, so there was no worry of getting stuck with a circus tent or a body conscious size. I contained my desire to hoard all teh coconut water and gleefully accepted my Fuller's ale. I also scored some sports 'jelly beans', a High 5 gel and a couple of High 5 Protein bars. Not going to lie, the protein bars look pretty horrendous, but don't worry they taste just fine. 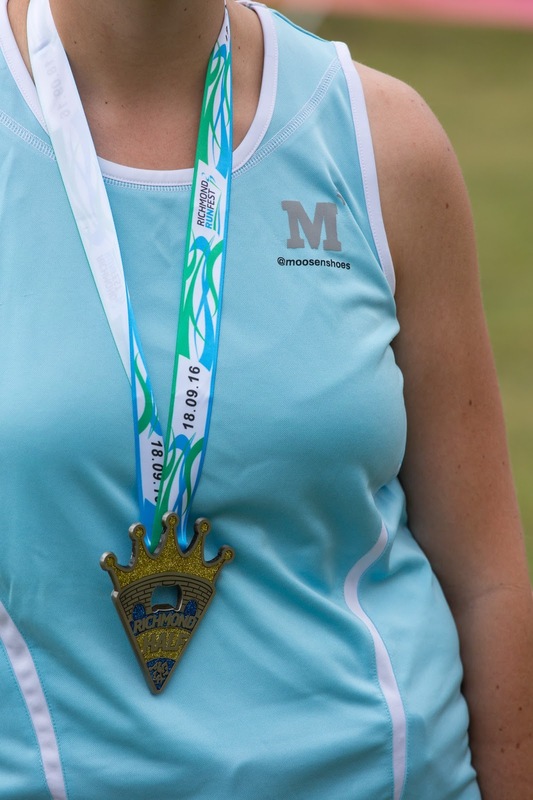 Oh and the medal is also a bottle opener. I felt like they missed a trick giving us cans of beer rather than bottles, but I am pretty sure that was a smart move from a health & safety perspective. The band at the end was pretty great, and we spent an hour or so sitting on the grass, stretching, drinking and just enjoying the vibe before heading back via Richmond station. Conclusion: From a race perspective I highly enjoyed it. The course was flat but interesting, the crowds supportive, and the goody bag quite fabulous. Again the fact the race starts in Kew makes this a unique one to add to your race calendar. Good transport links to both the start and finish, although some would argue the District Line should never be classified as 'good' (I swear it gets slower every time I take it... but darn it the old girl she still gets you there). Personally-- I had two goals in this race. The first was to run it in its entirety, something which after Bacchus I was not sure I was ready to do. Second was to keep my pace under a certain time. Save for the first mile I was well under that. So even though this was my slowest half marathon that I can recall, I feel proud that I accomplished what I wanted to do. It gives me that little boost of confidence, and a glimmer of hope that maybe not all is lost and maybe I can achieve my marathon goal if I just keep the faith and stay true to my training. 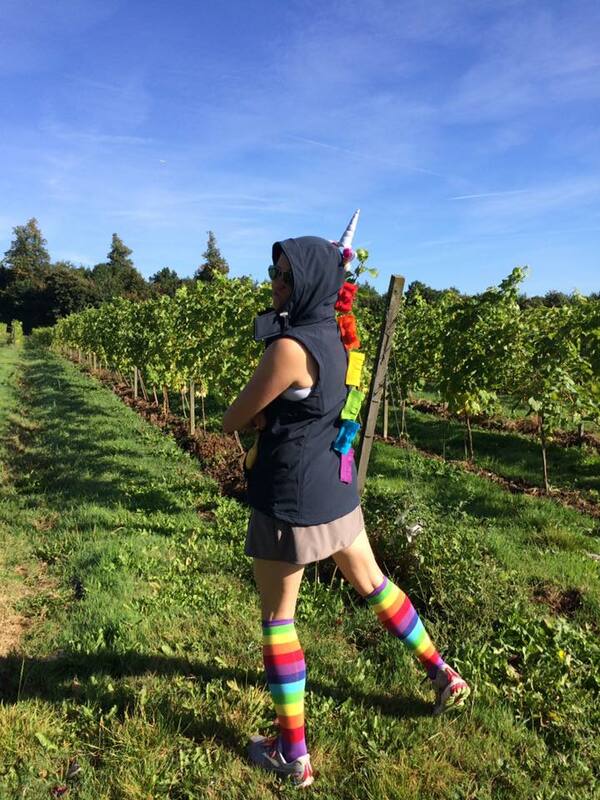 Quit Your Wine-ing: Surrey Bacchus is Here! I walked into this race with a ton of apprehension. I did not feel ready at all to run 13.1 miles on the hills of Surrey. Legs still did not feel ready. "Trial by fire" was the phrase that came to mind as I boarded the train at Waterloo. At least the trains were working, unlike last year. I was hoping by this time I would have had an answer about my foot. In a amazing feat (feet) of almost Monty Python proportions, Bupa gave me a doctor for hand injuries, not feet. Imagine my surprise after telling the nice Doctor all about my condition, only for him to say "I wish I could help, but I am a hand specialist." Oh well, it was a nice office. 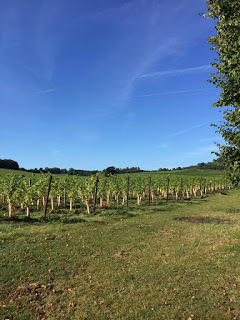 Location: First off, Denbies Winery is crazy close to the Dorking train station. Heck, if you wanted to you could get there with 20 minutes to spare and you could roll up to the start as long as you did not have a bag drop off or bib pick-up. Probably. Don't quote me on that. However getting there does require an epic roundabout navigation. And it can get quite busy-- so hone your Frogger instincts! Bib Pick Up: Queue manic queues #1. It got a bit confusing as we were not aware the lines were split into alphabetical ordering. We realised this quickly though as we got towards the front, told the people behind us, and quickly truffle shuffled to the correct lanes. I wish they would move people along who were just loitering in that room, made it a bit more chaotic. Loos: I can only speak for the ones in the Winery, as I did not use any port-a-loos (my loss). Of course there was a line, but it moved quickly enough and there was plenty of toilet paper. There was a woman in there tidying up and checking the stalls so good kudos for that! Bag Drop: Easy and quick. Same for pick-up which is a Godsend when all you want is to change out of your trainers and into flip flops. Atmosphere: Wheee! Such a fun vibe on and off the course. As you can gather, most people are in fancy dress (especially the half) so it's a very friendly race. Cheering each other on ("Go Batman! Come on Robin, don't let Batman show you up!") and typical banter is very common. It makes me doubly glad that headphones are not allowed. A running buddy (@_jen_mo) put together a video of our group and the race in general which you can watch here. Drink Stops: Well this is really what we all come here for. The wine... err.. water stops. Whatever. There were 7 stops this year, with 1 (near Ranmore Common) being dry, I assume thats because it's on National Trust land. Who knows, maybe they didn't have any more wine choices. Either way, all the stops have amazing volunteers distributing wine, water, and various treats. It was a cornucopia of culinary delights: swiss rolls, brownies, bananas, oranges, jelly babies. Pretty much anything a runner could want. The wine samples were a bit small, but I think they have no issues with you going up for seconds. Stop 4 and 7 we definitely my favourites. The former was served by two older gentlemen in waiter uniforms. I wanted to take them home with me and adopt them as my grandfathers. They had an amazing band playing. Whatever group that runs that drinks stop should get medals. It was brilliant. Stop 7 was at the top of the hill overlooking the Winery, so the end was in sight. This was the only stop that I saw that had red wine, but what got me was the food serving was: cheese and crackers. Oh. My. Goodness. I could have stood there and ate it all, but with finish line looming-- I managed to tear myself away. One negative was some of the stops were overrun (literally) with people, so the queues were getting a bit unwieldy. Hog Roast/Finish: Yes there were even more treats after we crossed the finish line. Tea (I love this country), coffee, water, and again more snacks, including pineapple and melon. 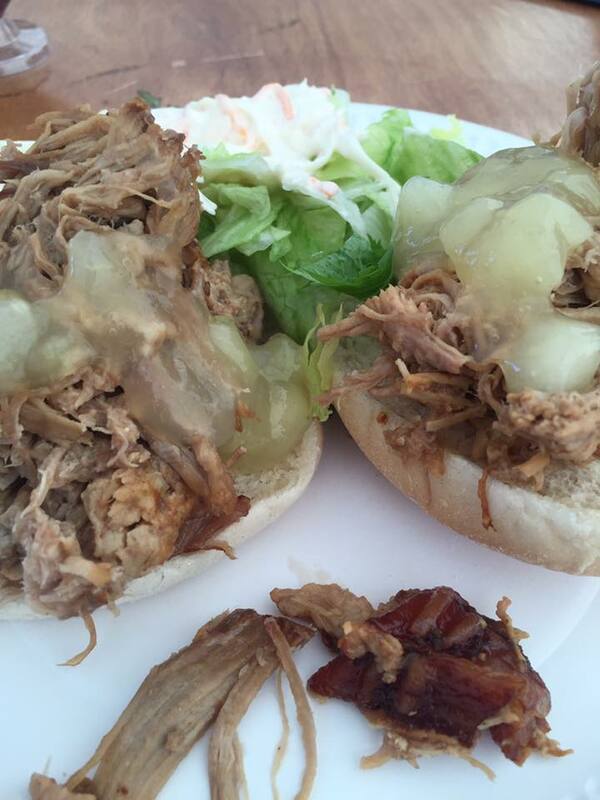 However, no point in filling up when you have a hog roast to look forward to! The portions were pretty great with some good sides and the ever important applesauce. They also had a vegetarian option, but I cannot comment on that. 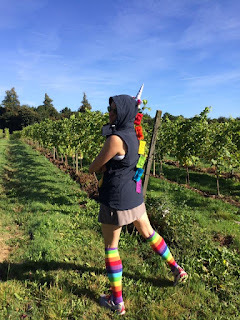 My Personal Notes: I did this in a run/walk fashion, this worked out well as although I was part of a larger herd of unicorns (actually it's a blessing), the two friends I was running with were also fine to do a walk/run so there was never the "I am slowing people down" feeling. I also kept telling myself to manage my expectations, I was not going to finish in the time I did last year. It was also quite warm (about 18° C) and no clouds in sight. Is it an excuse? Maybe but I am going to take it. I had a great time, and even partook in a sprint finish. 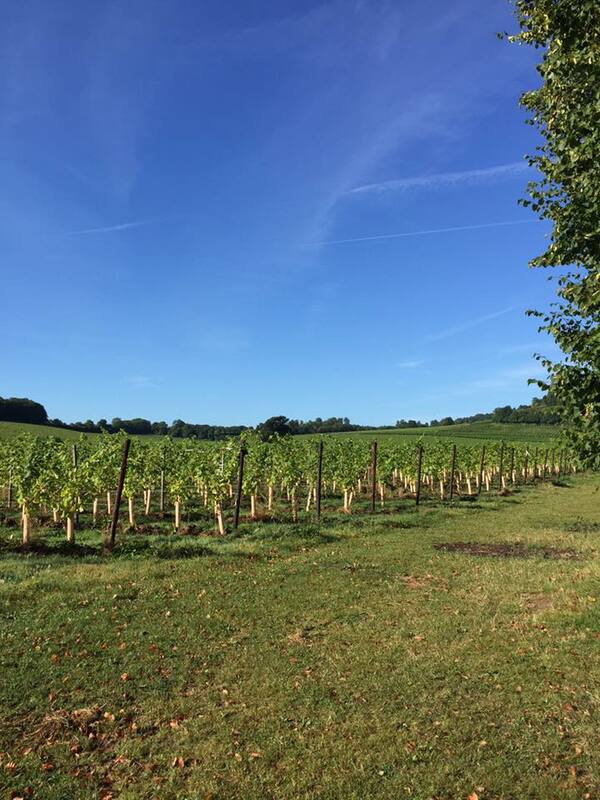 Conclusion: This is a pretty brilliant race, with epic views of the Surrey hills. There are also cows (real and people in costume) on the course, which is always a win for me. Great volunteers, marshals, and a venue with ample parking and close to rail. I have not run this course in the rain, but I feel everyone is having such a good time it would be taken in stride. When running is "your thing", when it has become pretty much what you do most waking moments, it is quite difficult to suddenly NOT do it. You feel bad, you envy every runner you see, and abstain from that slice of cake because you are not running crazy miles anymore. Nothing seems to compare to running. What is even worse when you cheat and go for a run, and it hurts. When you realise your legs are still tired and something is still not right. Then you wonder if you will ever run again and panic at all the races you already signed up for. changed so much since I was a kid, the waterfront is so vibrant and people are actually coming downtown for the afternoon/evening with no sporting events. Restaurants are popping up everywhere, and the food is (of course) phenomenal. I did some kayaking along the Buffalo River-- with the backdrop of the old silos, the once powerhouses of industry that made the city one of the largest in the United States. Brilliant. So I decided to go for some runs. I couldn't help it. The weather, although high sun at times swelteringly humid, was too lovely to pass up. A run in the 'burbs, a little trail run, and run along Lake Erie. All under 5k. The last one was very hard for me, but I blame humidity and my Uncle running at too fast a pace for me to keep up for long. Still after running the distance I did, it was heartbreaking to feel so winded and so tired. As soon as I got back to London I called the doctor for my X-Ray results. I didn't know what worried me more; finding something or finding nothing. The result was the latter, with my GP recommending me to an orthopedic surgeon. That sounds... terrifying. I am meant to start marathon training next week, which is of course interesting given my weird limbo running situation. Never minding that, I have Surrey Bacchus coming up as well. I have not run more than 10 miles IN A MONTH. No pressure here! Currently my hope is to ensure I run a 10k this week in prep for the half... gosh really cutting it fine aren't I? This should be interesting to say the least. So everyone happy and healthy in running, don't think less of me if I slightly scowl if you pass me by. I am insanely jealous of you. We take for granted running, it's always when you take it away that you realise it really has become a part of your life.